A major part of any Salesforce developer’s job is debugging. Because Salesforce has a multitenant architecture, debugging on the platform is a bit different than it might be in other development environments (e.g., you can’t breakpoint your code or do live debugging) though it is useful nonetheless. It can sometimes be difficult to know where to start with so many options: log statements, code checkpoints, trace flags, and Apex debugger, etc. Plus, there are a number of different places to do your debugging depending on your environment: Eclipse Force.com IDE, debug logs, the developer console, and paid options like Illuminated Cloud. Where does one begin? At Dreamforce ‘16, Appirio’s Bryan Leboff gave a great talk on best practices for debugging Apex that inspired this post. A typical Salesforce log contains a number of things: code execution, debug statements, timestamps and any governor limits you may be running into. 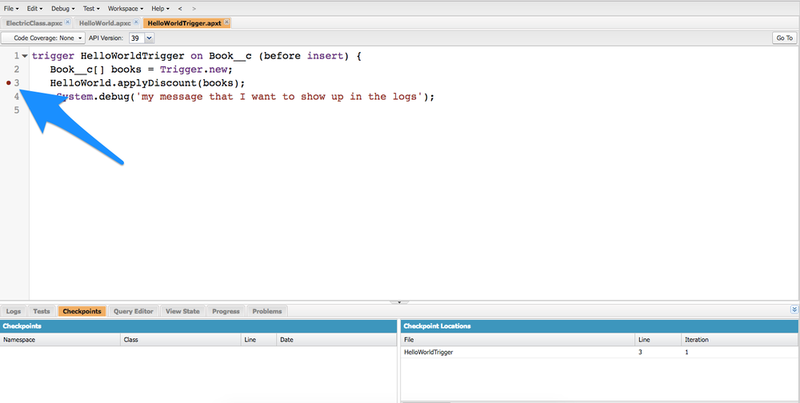 If I add a new Book, the Salesforce Debug Logs will display the statement that I added. Kind of like throwing a print statement in Python. But where do I see this log? First, go to Setup and search for Debug Logs. Next, setup a new Trace Flag. A Trace Flag tells Salesforce to log any activity caused by a particular user. Click New Trace Flag. The Traced Entity Name will be the user that we want to capture logs for. You can use your own user login or another user’s depending on who you want to generate the logs for. Typically for debugging you’ll use your own login. Once you are here, you now have log output you can look at. The first line is the Header. It provides version info and the log levels we set for the various logging categories. It’s here that you can see that your Apex Code log level is set to Finest while Validation is set to Info. Next you can see that execution units have started. An execution unit contains everything happens during a transaction. EXECUTION_STARTED and EXECUTION_FINISHED show the start and end of an execution unit. Within transactions you have code units. Code units are “discrete unit of work within a transaction.” Apex classes, triggers, and validation rules are all examples of a code unit. Each transaction and code unit includes a timestamp and the number of nanoseconds that have transpired since the transaction started (this is the long number in parenthesis after the time stamp). This can be useful for debugging performance issues. Salesforce has more docs on debug logs which are worth reading. You can also use the developer console for debugging. Salesforce has a concept called “checkpoints”. With checkpoints, you can “investigate the objects in memory at a specific point of execution and see the other objects with references to them.” You can get a dump of variable information at the time of that checkpoint. To setup a check point, click on the line of code where you want to take the snapshot in the developer console until it shows a little red dot. You can set up to 5 checkpoints at once. Using multiple checkpoints can help you figure out where exactly variable information changes. Heap information is also available on checkpoints. To learn more about checkpoints, check out this documentation. There are also some paid solutions that provide advanced debugging solutions. 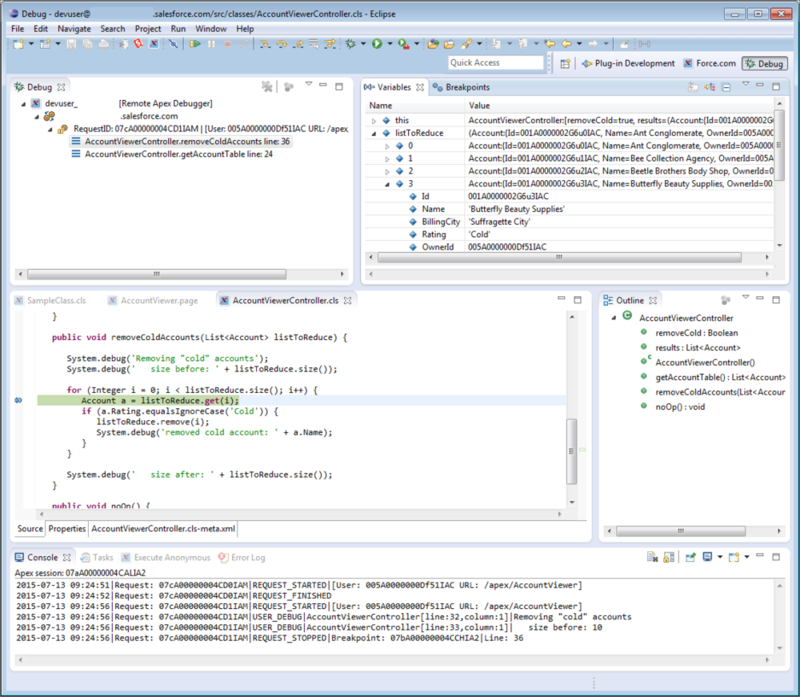 Salesforce sells Advanced Debugger which extends the Force.com IDE plug-in for Eclipse. It allows you to set breakpoints for Apex classes and triggers, view variables, see the call stack, interact with global classes, output results to the Console, and much more. 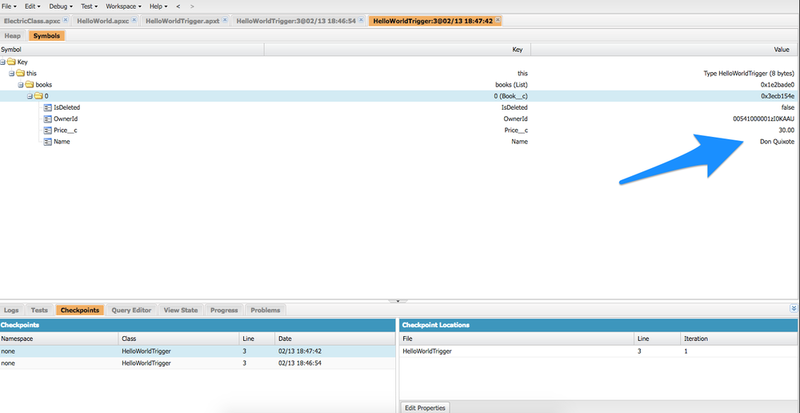 Some of the paid IDEs like Illuminated Cloud offer an advanced Apex Debugger as a part of their platform as well. Jitendra Zaa’s blog also includes a number of great tutorials and posts about debugging including videos.